Sift the dry ingredients together into a large bowl and make a well in the centre. In another smaller bowl, whisk together the eggs, milk, melted butter, vanilla and orange zest. Gradually pour the liquid ingredients into the well in the dry ingredients, whisking constantly, until all the ingredients are incorporated and you have a smooth batter. 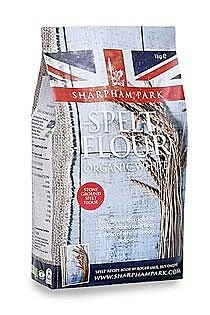 Cover and leave the batter to rest at room temperature for30-45 minutes so that the spelt starch cells can swell. This makes for a better waffle batter. 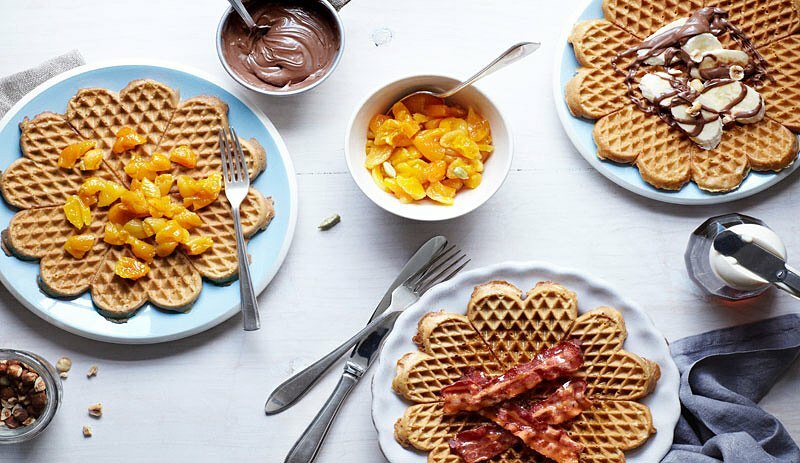 Switch on the waffle iron and when it is hot, pour in a small ladle of batter, taking care not to overfill - an undersized waffle is better than a lava-like over spill. Close the waffle lid and cook until crisp - times will vary according to the type of machine you are using, but it should be about 3-5 minutes per waffle. Serve with the topping of your choice. Put half (or as many as will fit) the bacon rashers in a non-stick frying pan and fry over a medium heat for about 6 minutes, or until golden and crisp. Remove from the heat and transfer to a plate lined with kitchen paper to absorb any excess fat. If necessary, keep them warm in the oven at 100°C/200°F/Gas ½ while you cook the the remaining bacon.Pile the bacon on top of the waffles and drizzle with lots of maple syrup to serve. Drizzle or smear the chocolate hazelnut spread over the waffles and put the banana slices on top, then scatter with the hazelnuts and cacao nibs, if using. Eat immediately. Put the fruit sugar in a saucepan over a medium heat with 500ml/17fl oz/2 cups water until all the sugar has dissolved, then add the vanilla, ginger and cardamom, stirring continuously. Add the apricots and bring to the boil, then turn the heat down to low and simmer for 10-15 minutes, or until they are soft. They shouldn't disintegrate into a mush, so don't stir too vigorously. Remove the saucepan from the heat and add the lemon juice. Leave to cool slightly before serving on top of the waffles.